HONG KONG - China is raising fees on packages ordered from abroad and cracking down on smugglers who carry in suitcases full of luxury goods, in a concerted effort to encourage shopping at home and squeeze a grey market that shoppers use to avoid tax. Although Chinese shoppers account for a third of global sales of luxury goods, sales that actually take place in mainland China account for only a fifth. The rest are purchases made abroad -- either ordered from overseas websites, bought by Chinese tourists, or smuggled in by "personal shoppers" known as daigou, who fill suitcases with luxury items and sell them back home in person or online. That costs the Chinese government tax revenue, and also discourages the domestic consumption sector, particularly for higher quality goods, that Beijing has long been trying to boost to rebalance its economy away from exports. "China wants to attract the outbound purchases back and cultivate a domestic luxury consumption market which is also consistent with the target to develop a consumption driven economy," Yating Xu, an economist for HIS Global Insight said. 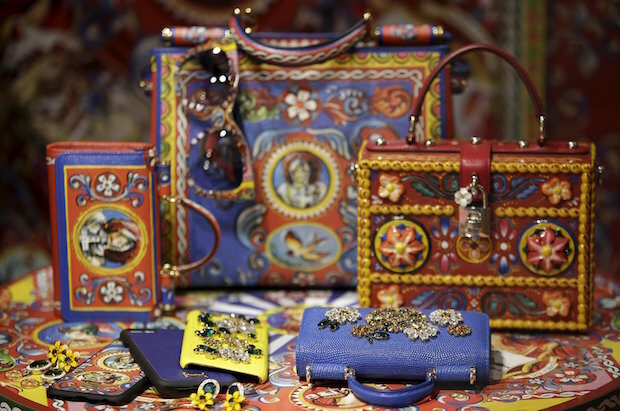 Luxury items like the latest Dolce & Gabbana bag can be around 50 percent cheaper in Milan or in Paris than in mainland China, although some brands like Chanel lowered Chinese prices last year to close the gap. Some Chinese also prefer to buy expensive items abroad because they can be more certain the goods are genuine, and can get better choice or service than at home. Luxury firms have invested in opening boutiques in China, but they sometimes sit idle, potentially damaging their brands. The problem has gotten worse over the past year, according to figures provided by the consultancy Bain & Co, which found that luxury consumption in mainland China fell 2 percent in 2015, even as purchases by Chinese buyers rose 251 percent in Japan, 31 percent in Europe and 33 percent in South Korea. The parallel market, mostly conducted online, is crowding out bricks-and-mortar shops, said Roth Lai, deputy editorial director at Elle China, speaking at a conference on luxury in Paris this week. "E-commerce has become really the main driving force in the luxury goods market in China," he said. "But I think the Chinese will continue to buy outside of China for the foreseeable future, until there is a major shift in economic structure in China." To combat the daigou, the Chinese government last week increased penalties for false declarations and tightened customs controls. Officials are catching more and more Chinese travellers at the airport with suitcases full of luxury goods and slapping taxes on them. Beijing also said that from April 8 it would increase taxes imposed on a range of goods either imported via the Internet or carried in by daigous. Tariffs on watches ordered from abroad were increased to 60 percent from 30 percent and on jewellery to 15 percent from 10 percent. "We expect an adverse impact on overseas purchases by Chinese daigous and tourists alike," said Exane BNP Paribas analyst Luca Solca. China has also tightened the use abroad of UnionPay cards, the government-supported payment card network. As of January, there is an annual withdrawal limit at overseas cash machines of 100,000 yuan ($15,471.49) per card.